Repair leaking rivets, cracks, and seams on aluminum boats. This 2-part epoxy adhesive sealer comes in a convenient cartridge with a mixing tip that dispenses the exact 1:1 ratio with no measuring, mixing, or mess. Cured resin flexes to prevent recurring leaks. Works on properly prepared aluminum surfaces. Two-part formula is automatically measured and dispensed at the proper ratio. Static mixing tips are included and ensure proper mix in a controlled bead of material. Leak Sealer can also be mixed manually. Even if you don’t jump beaver dams in your aluminum boat, normal wear and tear can eventually cause loose rivets and seams to leak. Or maybe the leaks were a gift from the boat’s previous owner. Other repair products usually require the entire hull to be coated, and they can shrink and crack, or fail because they don’t tolerate the hull flexing. At TotalBoat, we worked long and hard to come up with a faster, easier to use, more reliable fix for these common problems. If you suffer the double discomforts of constant bailing and wet feet, TotalBoat Aluminum Boat Leak Sealer has the long working time and fast cure for what ails you and your aluminum hull. There’s no mixing or measuring because the resin and hardener come in a single cartridge that fits any standard caulk gun. Just attach the included mixing tip and squeeze the handle on the gun to apply. It’s that easy, and you’ll really like the fact that Aluminum Boat Leak Sealer is sag resistant so you don’t have to tip the boat at odd angles to keep the sealer from dripping out. Even better, you can apply it in less than ideal conditions, even in temperatures as low as 40°F. Just be sure to store the cartridge at 60-90°F when you’re not using it. When you’re finished, cleanup is easy, too—just leave the mixing tip on the cartridge and let it cure. Next time you need to use Leak Sealer, just twist off the old tip and replace it with a new one. After applying, wait 7-10 hours before sanding or painting. Then turn your old bailer into a bait bucket and get back on the water. Size: Available in a 250 ml. cartridge that fits most standard caulk guns (sold separately). Includes 2 static mixing tips. Additional mixing tips are available, if needed. Note: If UV protection is needed, an appropriate coating must be applied over the properly cured Aluminum Boat Leak Sealer. Safety information: When handling and working with this product, please use gloves, eye protection, and clothing protection. Avoid contact to skin and eyes, and use outdoors or in a well-ventilated area. 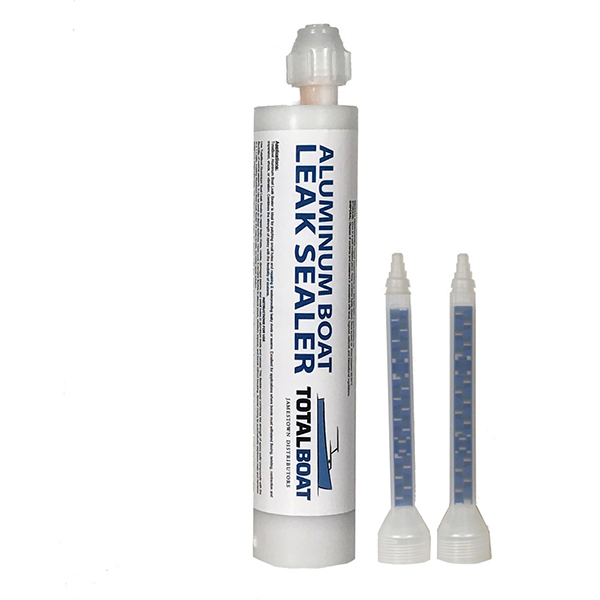 IMPORTANT: TotalBoat Aluminum Boat Leak Sealer is not designed as an emergency repair product. For waterproof emergency repairs, use TotalBoat Underwater Repair Epoxy.